Multi-platinum rock band Shinedown has announced ‘An Evening With Shinedown’ live dates -an intimate, limited run of shows kicking off May 6th in New Orleans. 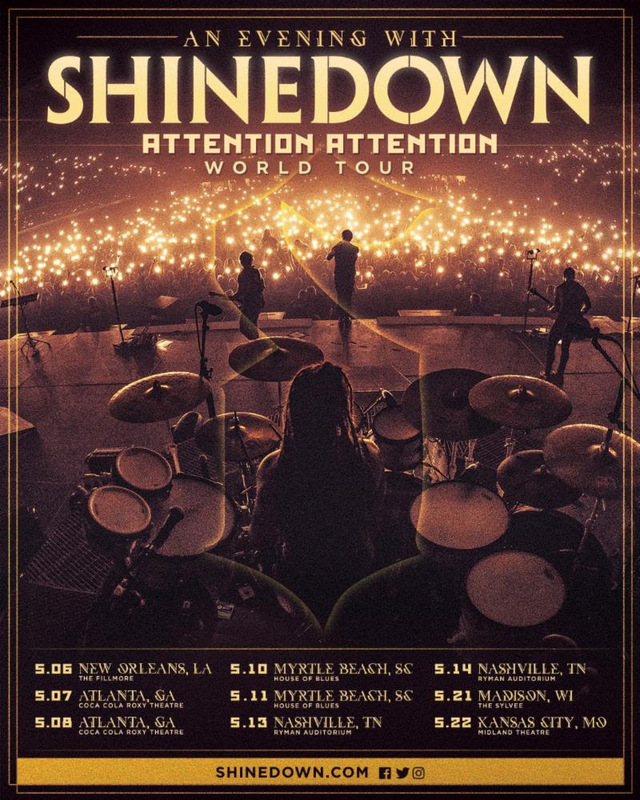 These nine special shows will offer fans an exclusive, up-close-and-personal live experience amidst the 2019 ATTENTION ATTENTION World Tour, which will see Shinedown pack arenas backed by their biggest, most eye-popping production yet. Following the high demand for tickets to Shinedown’s three intimate, year-end shows at the House of Blues in Orlando on December 27-29, the band is thrilled to be bringing ‘An Evening With Shinedown’ to select cities around the country. Shinedown‘s uplifting new anthem “GET UP” (PRESS HERE) has been moving listeners around the globe with its offer of hope, empathy and encouragement in the face of personal struggles, whatever they may be.Offering a light in a time of darkness is somethingfront man Brent Smith is deeply connected to after battling his own personal demons, and “GET UP” was born out of watching his friend, Shinedown bassist Eric Bass, deal with clinical depression. When Brent put pen to paper, a beautiful, universal song rooted in Brent and Eric’s raw vulnerability took shape. Reaching far beyond any genre or label,“GET UP” speaks to the human spirit in a time of need, and it’s a song that has already resonated with the masses – becoming a fan favorite at arena shows on tour where the crowd response is palpable. It has drawn attention from the likes of Huffington Post, Salon, Rolling Stone, Buzzfeed, Parade, Grammy.com, No Depression and more, is approaching 20 million total streams with key playlisting on Spotify and Apple Music, recently hit #1 at Active Rock Radio, is quickly climbing at Alternative Radio and broke a new record for Shinedown, giving the band the most Rock Airplay Top 10s ever and their 13th #1 on Billboard’s Mainstream Rock Songs Chart, the second most in the history of the chart (tied with Van Halen).